Over twenty years ago the United Nations recognized March 22 as the first World Water Day. 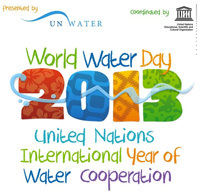 The theme for 2013 will be around the International Year of Water Cooperation. So what can I do to cooperate with water conservation? Monitor all water bills for unusually high use. The bill and water meter are tools that can help to discover leaks. – I know where my leeks are, I keep them in the veg box! Plant in the autumn when conditions are cooler and rainfall is more plentiful. – In Ireland? Everyone including the cat knows we get all four seasons every hour, every day, EVERY YEAR! If water runs off the lawn easily, split the watering time into shorter periods to allow for better absorption. – What? You mean do it in between the showers? Water the lawn and garden in the morning or evening when temperatures are cooler to minimize evaporation. – If I went out to water the garden early in the morning, I’d have chilblains on my chilblains! Don’t water the lawn on windy days when most of the water blows away or evaporates. – I wouldn’t do that. I might be blown away and then who would turn off the water? When you give your pet fresh water, don’t throw the old water down the drain. Use it to water your trees or shrubs. – I don’t have pets for this one. Wash fruits and vegetables in a pan of water instead of running water from the tap, then reuse it to water houseplants. – I’m the only house plant round here, do you think it would work on Rose Marie? When you save water, you save money on your utility bills too. Saving water is easy for everyone to do. – I tried putting it in my piggy bank, alas, it went everywhere except in that coin slit. Listen for dripping faucets and running toilets. Fixing a leak can save 300 gallons a month or more. – The only drip round here is me! The topic Frugality was brought to our Loose Blogging Consortium playground this week by The old Fossil. My take may seem flippant, but it is very much tongue in cheek. The weather outside is certainly not frugal or timid right now (Thursday 21:20). I am listening to the swirling & howling wind, aware that NIE has emergency crews, engineers and call handlers on stand-by. The local airports are asking passengers to check the status of their flight before leaving home. We also have weather warnings of heavy rain followed by ice, snow and blizzard conditions overnight and tomorrow. I’ll stay home, cosy and warm for the duration and distract myself by visiting our other active members: Delirious, Maxi, Maria/Gaelikaa, Maria SilverFox, Padmum, Ramana, Shackman speaks, The Old Fossil, Will Knott. This entry was posted in Loose Consortium Blogging on March 22, 2013 by Grannymar. Huh! We think it is bad here???? Giant hailstones batter China’s southern provinces, some as large as 8cms leaving nine people dead and about 300 injured. Some car windscreens look like colanders and Winds reached 177kms per hour. I’ll stop complaining about the minuscule bit we have compared to that. I wonder how Delores is faring? We’re not exactly frugal but we do try not to buy things that are unnecessary. Wine and good food yes, wide-screen TVs and giant freezers definitely not. You have some good tips here, GM. We lost our dog years ago, rarely use the disposal since it’s only me, haven’t used the dishwasher since my husband passed. It’s a little nippy this morning but the weather in Central Florida is beautiful compared to what’s going on in your neck o’ the woods. And China, those poor folks. Your approach balances mine GM – I thought of mine as somewhat sardonic but now I see it was simply not as flippant as yours – LOL. Good job! Nick – Good food is a health benefit in my book and not a luxury. living alone, a small fridge/freezer fulfils all my needs. Maxi – We are only familiar with waste disposal units in the sink, from watching American TV programmes. We do not have them in Ireland and outdoor swimming pools would make mini ice rinks here! Brrr! Only dishwasher round here is me – full hands on variety! Being frugal with water, fossil fuel and energy are now part of all sensible people all over the world. My only regret is that it is coming too late in the day and we have to run to stay in the same place. 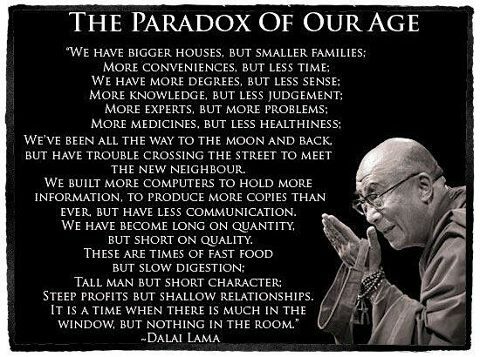 Ramana – I am inclined to agree with you on this one, but then. we are human…. When do we do things in advance? I make a point of not watering the lawn in the winter. Does that count? I was raised to be frugal with water, but then I live in N Calif. Had a dishwasher in one house, but my kids were of an age to do dishes, so we didn’t use it. Dish washing was a time to talk, tell stories, make plans…family time. All of the North Island have been listed as drought stricken, part of the South Island as well…this means if you have farm, or similar, the gov’t will help you financially. Delores – Old habits die hard! Brighid – ‘Dishes’ time in our house was noisy and hilarious. Granny, and uncles often rolled up sleeves and joined in the fun. Cathy – The whole world wide weather system is upside down.